While my first trip to the Vacation Kingdom was well before my memory formed, one of the first events I can remember attending was Walt Disney World’s 15th anniversary. 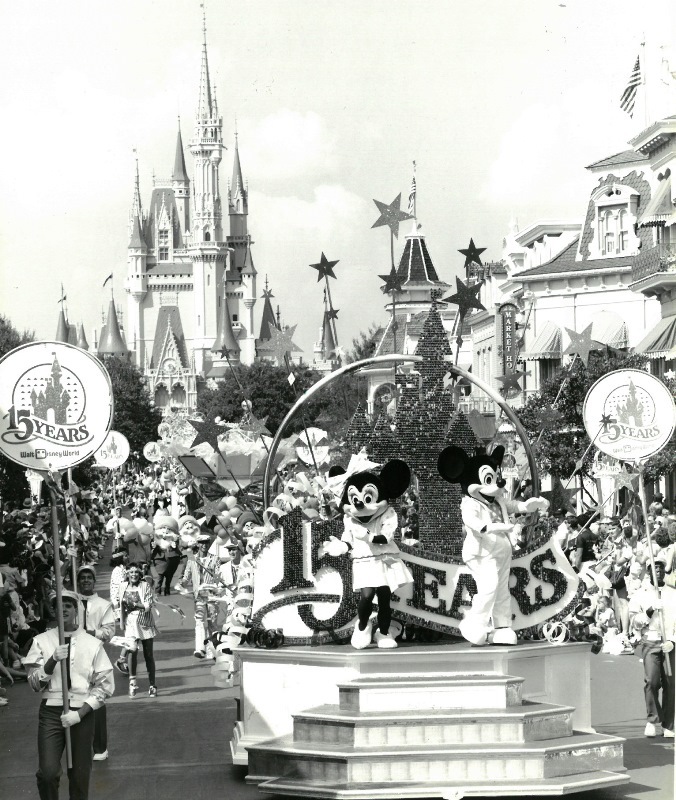 The year-long birthday party was affectionately known as the 15 Years of Magic. It included all sorts of special decorations, like a giant yellow pyramid cake in front of EPCOT Center, and constant giveaways from pins to Cavalier convertibles from Chevrolet. However, the centerpiece of the celebration was the entertainment offerings, particularly the afternoon parade. The music from the parade was as clever and catchy as anything Disney’s ever produced. The sign of which is that even now, more than 30 years on, I can still sing large sections of the song without assistance. Not that anyone wants, or should ask, that I serenade them with the pure 80’s sound. The parade featured Mickey and Minnie in the lead off float, dressed as something out of Miami Vice. They were followed by a large, top open present, which was one of several to be featured in the parade, usually in between two larger floats with characters in between. You can see one just behind Mickey and Minnie in the above photo. Other major floats included a band float with Chip, Dale, Pluto, Tigger, Br’er Bear, and the Big Bad Wolf getting funky. Coincidentally, “funky” is the words of a chipmunk, not this fair writer. The Fairy Godmother and Donald have their own respective floats as well, and a number of musical performers and dancers stand atop the glass castle float, a float that has been utilized for a number of parades over the past three decades. Perhaps the most memorable float, however, had to be the baking float. Here Liver Lips McGraw, Wendell, and Shaker of Country Bear Jamboree fame have created a batter tornado while trying to create a cake suitable for Walt Disney World’s 15th birthday. The inclusion of the Country Bears isn’t necessarily something to scribble out a postcard about, but it leads to another interesting piece of the parade. No, I’m not talking about the sparkly, roller skating performers, I’m thinking about the little known characters to permeate the parade. These days, there are special events to bring back some of the long lost characters, but many we’re present throughout this procession. Included amongst the rare to never seen these days were King Leonidas (Bedknobs & Broomsticks), Lulubelle (Bongo segment of Fun and Fancy Free), Penguins (Mary Poppins), Stromboli (Pinocchio), and even Suzy and Perla (two of Cinderella’s friendly mice). The 15 Years of Magic parade only had a short run from October of 1986 through to the following September in 1987, but between its music, floats, and abundance of characters, it is easy to see how so many of us who were children (or children at heart) remember it so fondly. What about you, were you able to join in the fun, or which anniversary event is a the party that you have an affection for from your childhood?